As a travel marketer or agency marketer servicing the travel industry, you have a tricky gig. You need to convince your prospects to spend thousands of dollars and precious vacation time. 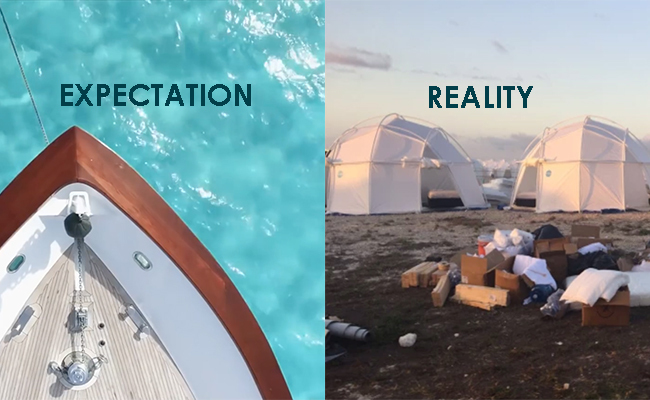 Meanwhile, your prospects are increasingly wary of the legitimacy of your offers (thanks a lot, Fyre Fest). Here’s to hoping your vacation is memorable, but not in a meme-worthy kind of way. Your challenge then is to effectively convey trust on your travel landing pages. Doing so can help ease prospects’ conversion anxiety, resulting in more travel leads and sales for your business. We often talk about the importance of trust and credibility on your landing pages — this isn’t a new idea. But for some industries, a lack of trust can have hugely detrimental effects on conversion rates. In a recent analysis of 74,551,421 visitors to 64,284 lead generation landing pages created in the Unbounce platform, data scientists found that travel landing pages can realistically achieve conversion rates of at least 12%. Even more impressive is within the travel and tourism industry, the very best pages convert over 25% of their visitors (schwing!). Notice the dramatic conversion rate difference between percentiles? If you’re part of that percentile getting 2.1% or lower conversion rates, your pages have lots of room for improvement. Image via the Unbounce Conversion Benchmark Report. If you’re not hitting these benchmarks, it might be time to take a hard look at your marketing and ask yourself if you’ve done enough to make your prospects trust you. And don’t worry if your answer is “No” or “I’m not sure.” We’ve compiled four data-backed ways to boost trust on your travel landing page. Use them as a jumping off point for your optimization efforts. Using an Emotion Lexicon to analyze copy, Unbounce data scientists found evidence that visitors to travel landing pages have slight concerns about the legitimacy of the offers. However, they also found that using at least 7% (and up to 10%) of your copy to establish trust could result in conversion rates that are up to 20% better. 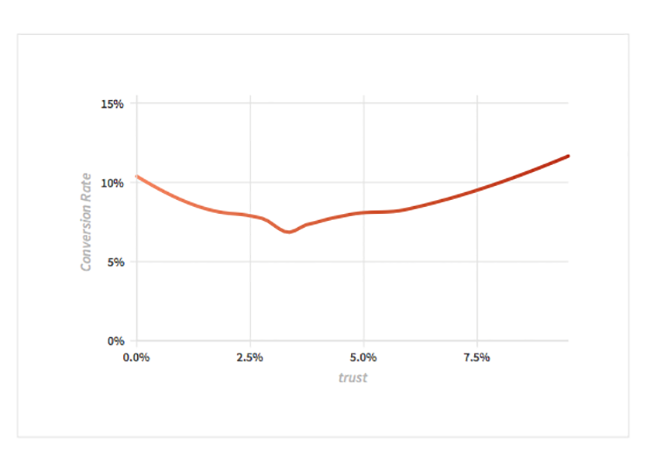 Notice the uptick in conversion rate once trust-infused copy is used more liberally? Image via the Unbounce Conversion Benchmark Report. The travel experts at Nordic Visitor do a great job of using trust words to build confidence on their Iceland site. It’s not a landing page per se, but the same principles apply. “Team,” “planning,” “provide” and “personal” are all words found to positively convey trustworthiness. Adding these and other trust words to your copy could be the subconscious nudge your prospects need to convert. 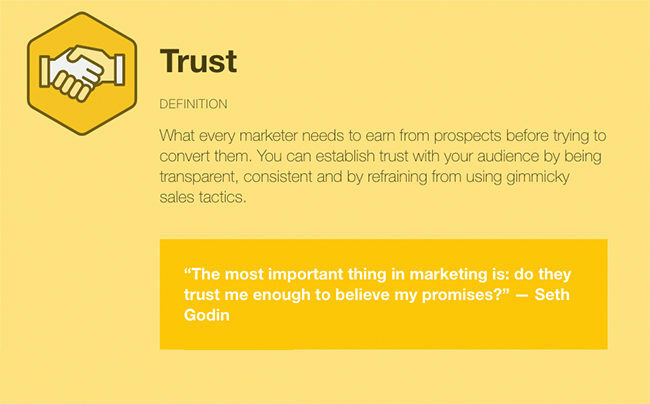 Take stock of the trust words you’re using in your marketing, and particularly on your landing pages. If they’re looking a little sparse, test out using confidence-building words to describe destinations in detail. Just as trust words can drastically improve your conversion rates, words that subconsciously trigger fear or anger will have a negative impact on travel landing page conversion rates. 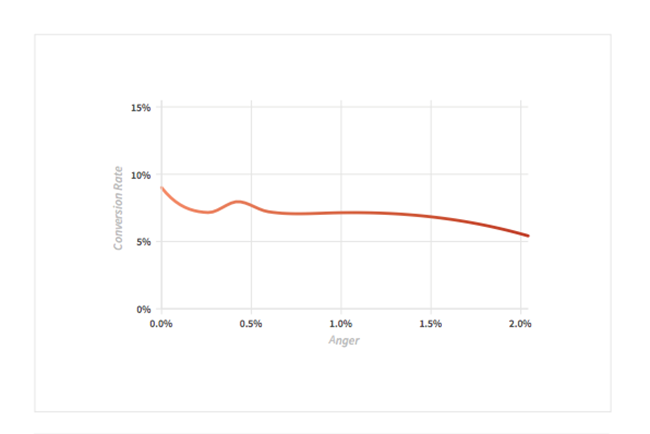 In fact, Unbounce data scientists found that if even 1% of page copy reminds your visitors of feelings of anger or fear, you could be seeing up to 25% lower conversion rates. No one wants to be angry while on vacation. Image via the Unbounce Conversion Benchmark Report. Download the Unbounce Conversion Benchmark Report to see how emotion and sentiment may be impacting conversion rates in your industry. Persuading your prospects to put their trust in you is tricky business, and it’s even trickier when it comes to travel, because they’re likely working with a tight budget and only a few weeks of precious vacation. They don’t want to take a leap of faith — they want a sure thing. A proven strategy for easing prospect anxiety is to use social proof. It’s the “everybody’s doing it” mentality that helps convince your prospects to convert. When you let your satisfied customers sing your praises, your credibility goes through the roof. Including testimonials on your travel landing page can have a positive impact on how trustworthy your prospects perceive you to be, but not all testimonials are created equal. Don’t tell your prospects how great you are, show them with real live, happy customers. Similar to testimonials, including reviews on your travel landing page can help convey trust to your prospects. The luxury travel designers of Jacada Travel have embedded reviews from Trustpilot, a reputable online review community, directly into their landing page. If you recall, the word “award” is associated with trust on travel landing pages. So if your company or client has won any reputable awards, be sure to flaunt ‘em. 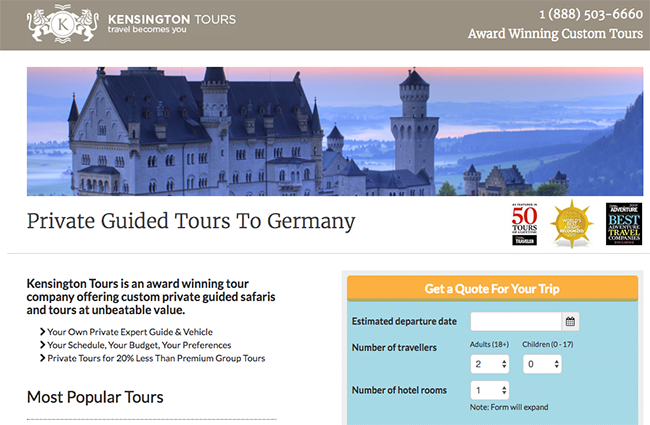 Tour guide company Kensington Tours not only includes several award crests on their travel landing page, they also mention in their Adwords ad that they’re a National Geographic award winner. Highlight awards strategically to build confidence in your offers. Persuasive trust-infused copy and social proof are wonderful, but when you’re collecting travel leads and even money, you need to assure your prospects that their data and money is safe. There are many ways to do this, but the two most impactful strategies are to enable SSL (Secure Sockets Layer) and to include trust seals. SSL creates an encrypted link between your landing pages and your visitor’s browser. It’s identified by the little lock icon and the “https” (vs. http) in the top left-hand side of your browser search bar. Enabling SSL on all your web properties (but especially on your lead gen and ecommerce landing pages) assures your visitors that they’re not at risk of being hacked. Psst: SSL is available on all paid Unbounce plans. Don’t publish a landing page without it! Nordic Visitor nails it yet again with a trust seal from GeoTrust and a TripAdvisor Certificate of Excellence 2017, further reinforcing their credibility. A lack of trust in any industry can hurt conversion rates, but in the travel industry the stakes are extra high. Fortunately, this means the opportunities to improve your conversion rates are plenty. And if you nail the whole trust thing down, you could be seeing some of the highest conversion rates across any industry. Leveraging a combo of effective copy, social proof and security measures, you can make your prospects forget about the stress associated with booking a vacation. Skip that trip to Poor Conversions-ville and instead put your feet up with a Mai Tai in hand on the Conversion Cruise. 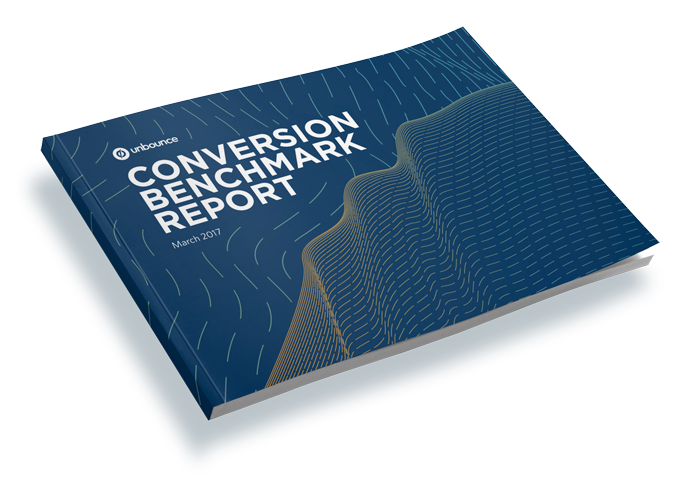 For even more data-backed conversion insights in the travel industry, or for insights into industries such as health, finance, higher education and more, download the Unbounce Conversion Benchmark Report. 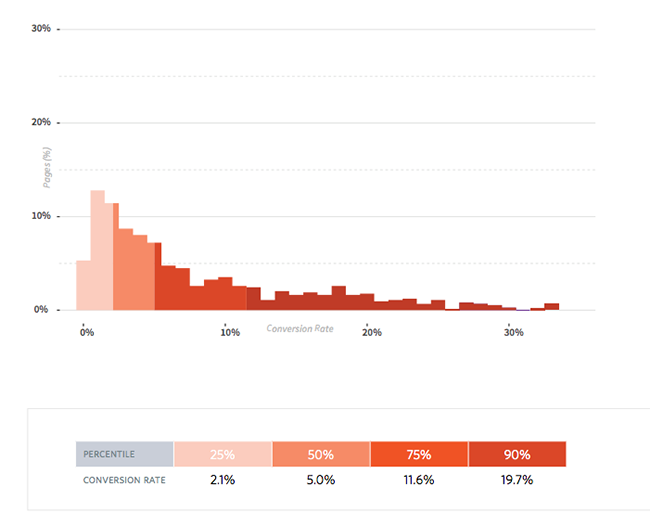 Download the Unbounce Conversion Benchmark Report to see how your conversion rates stack up against the competition — and how to improve them. Launching a travel landing page from scratch? Try out one of our travel landing page templates, designed specifically to boost conversions.